Angela… I honestly do not know how to begin! Started off in hairdressing, and then moving across to beauty industry many moons ago (! ), she began working in Arnotts/Frasers. She then went onto a local salon where, alongside this, she was a make up artist for catwalk/runway shows. As her client base grew she stepped out by herself renting a room to do her beauty treatments in the West End of Glasgow, before opening her Salon 20 years later “Angela Mackenzie Beauty”. And now a few years and a couple of kids later here we are! Angela is a beautiful lady inside and out (which has nothing to do with Caci facial treatments, lash extensions, spray tans… ha ha), and runs a fun yet professional salon. Angela specialises in Electrolysis hair removal, (and her clients might say her famous eyebrow shaping! 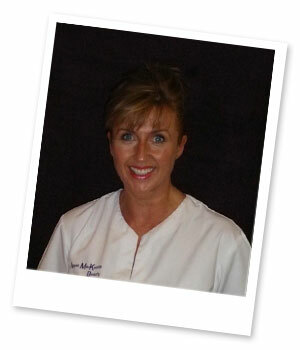 ), as well as having many years experience in all beauty treatments.